One of our favorite beach activities is gathering seashells and rocks. 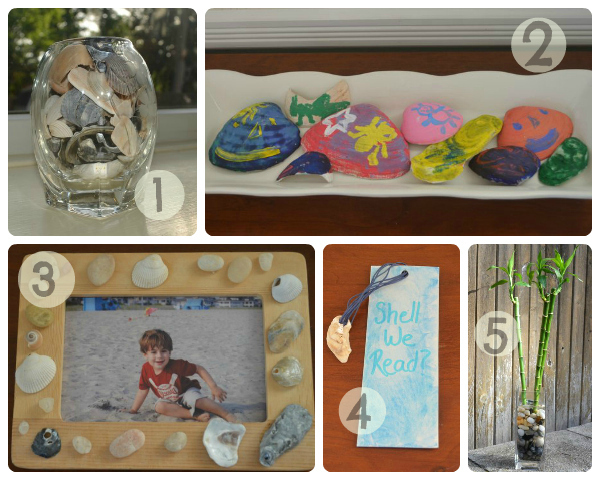 With all the shells my little guys collected, I wanted to create a couple of ways to display those shells to remember our beach walks. Some of my favorites are below. 1. Empty Vase: My 4 year old was so excited about shells that we filled a clear vase with shells for him to keep in his room to remember the shore all year. 2. Painted Shells: My 4 year old and a family friend enjoyed painting these shells together, using both paint brushes and sponge stamps. 3. Picture frames: My 4 year old laid out how he wanted the shells arranged around a craft store frame, and I glued it together. 4.Book marks: We made a couple of these “Shell We Read” bookmarks. I used waxed cotton jewelry floss for the tassel. I found it worked best to knot it in the back of the shell, and then put a bit of Mod Podge over the knot. 5. Bamboo holder: I put the bamboo in the vase and both of my little guys (1 and 4) played with the stones and shells and to fill it. Another idea I love is to create a beach memory jar, using a glass jar. Fill it with sand from your trip, a few shells, and a picture. Here is a very cute example. We have 2 other trips to the beach planned for this summer, and I am sure my 4 year old will want to bring some shells home. I would love to hear your ideas for using shells in the comments! You can also check out some ways we play with seashells here.